If not, PM me for details. Last edited by pingu on Sat 06 May, 2017 20:08, edited 2 times in total. looks great, could you do a thicker version? and I think they are much higher, but I feel a insecure to have just a bit of steel with no base holding all the weight of the seat. Would you be able to make one much thicker? I'd really like one like yours which feels more safe, as it supports part of the rail, but I'd like it twice as high, or at least 1,5 times high. I looked at the Thayler ones and decided that they put too much pressure on the floor. The original area in contact with the carpet is 2400 sq mm. The area in contact with the carpet in the Thayler solution is at most 500 sq mm - nearly five times the pressure on the carpet and hence the floor. 1. The spacer will need to be wedged in order to maintain full contact with both the seat base and the carpet. 2. The length of the nut may become an issue. If it is too long, it could shear when it is tightened. 3. The angle the seat makes with the floor will become so great that the hole in the seat will no longer align with the floor stud. The floor stud will then be bent out of position. xtLSport wrote: Can you make it?? I could make the Thayler solution with great ease. It is just a collection of stuff you can buy from Screwfix. I think that a better solution would be to combine the two solutions. In order to do that, I would need to measure the Thayler solution in place. pingu wrote: I looked at the Thayler ones and decided that they put too much pressure on the floor. Thanks for your constructive answer! 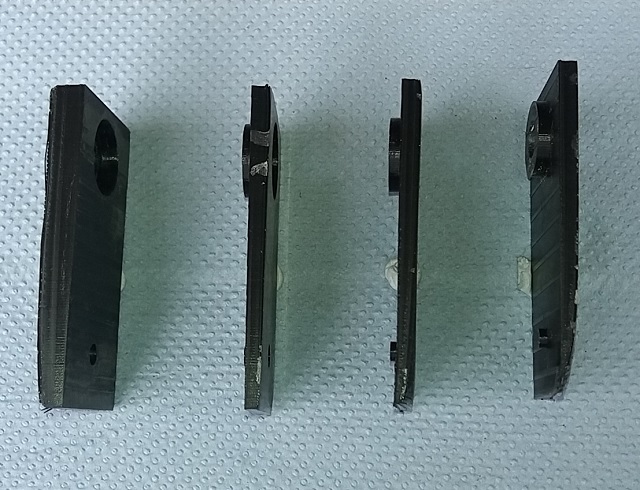 The ideal solution to me would be to make a thicker version of yours, maybe not twice as thick, but just some more... That would mean your spacer would be also longer to accomodate the rail further away. But not even sure that's really needed. As you can see in Thayer's picture the space between rail and floor is almost as much as the rail is wide. So, almost a square. In your solution it's half this heigt, or less. Which is already an improvement, but I prefer it to be a little higher. And also can propose them on my website - maybe you know it. I'm just about to go outside and investigate a solution . Last edited by pingu on Fri 03 Mar, 2017 13:54, edited 1 time in total. pingu wrote: I'm just about to go outside and investigate a solution . 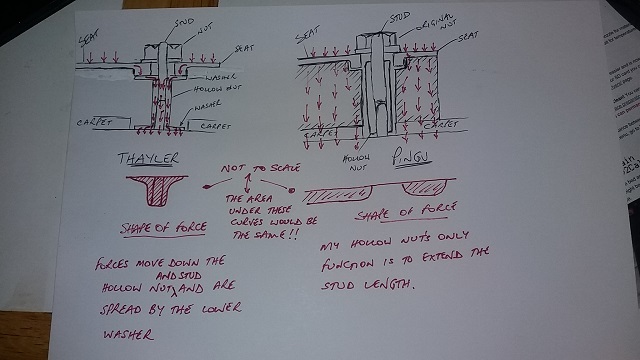 Further investigation tells me that the Thayler solution actually changes the design of the seat base mounting. The original solution PULLS the stud. In the event of the seat base being forced downward, the load is spread over an area of 2400 sq mm. 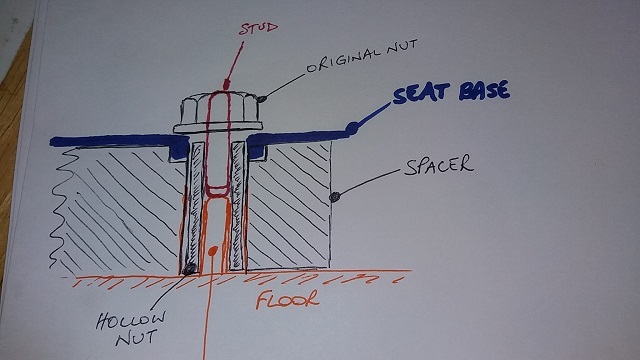 The Thayler solution uses the stud as a locator and the stud is not being pulled towards the seat, it is being used to hold the hollow nut in place. In the event of the seat base being forced downward, the load is spread over the area of the washer below the hollow nut (500 sq mm). My solution is to use the spacer to take the weight of the seat base, and use the Thayler solution to locate the spacer and the seat base. As there will be a slight gap between the hollow nut and the seat base, the hollow nut will be an extension of the floor stud. In my solution, the stud will be PULLED. I've tested the solution using scraps and multiple spacers. At the moment the 3D printer is rattling away making a 23mm spacer. I'll have to test it for strength once it's completed - a firm thump with a 14lb sledge should be a good test . Very interesting, but not sure i'm getting it 100%. So you would keep the thayer solution and just add two spacer on both sides of the thayer solution, to support the weight of the seat? Or would you create a 1 piece spacer that is screwed on the stud and do a hybrid version of both? xtLSport wrote: Very interesting, but not sure i'm getting it 100%. Notice the space between the "hollow nut" and the "original nut" on the sketch. This is very important because it totally changes the design. The red arrows are the force "path" for each solution. In the Thayler solution, the forces travel from - the seat to the washer - to the hollow nut and upper stud - (*) -to the floor stud and hollow nut - to the lower washer and floor stud - to the floor. In the Pingu solution, the forces travel from - the seat to the spacer - to the carpet - to the floor. The most important thing to notice about the two sketches is the "graphs". The area under the curve is the force and the area would be the same for both solutions as the force (weight) of the seat is the same. The "height" of the curve is the stress. As you can see, the shape of the Thayler solution means that the stress must be much greater than the Pingu solution - at least 2400/500 (nearly 5) times greater. Failed the sledge hammer test - I need to reinforce the solution. I've decided that the solution above is too much of a faff, so I've ordered some aluminium and I'm going to make some spacers from that. Am i missing the point? are you aware the seat height is electrically adjustable or are you abnormally short? apologies if so then maybe a cushion is a simpler solution, Jeremy..
Z3Jeremy wrote: Am i missing the point? are you aware the seat height is electrically adjustable or are you abnormally short? apologies if so then maybe a cushion is a simpler solution, Jeremy.. The height adjustment raises the front and rear of the seat equally. These seat spacers only raise the front. As above reply, the seats are a little on the horizontal side, but with the front lifted the seats become much more supportive and comfortable. keep it going, as I mentioned I am interested in the final solution, I think you got the height right. Now it's a matter of finding the perfect set-up between the plastic part and the metal housing, but I think you are close to it! I've made a prototype that I'm happy with . I just have to do the admin. I'll post up the details soon. great! have you tested it? xtLSport wrote: hey @pingu, any news? I've decided to give 4 options for sizes. I've made a prototype for each and I finished the video about 2 minutes ago. It's uploading at the moment and I'll publish it tomorrow (hopefully). That looks nicely engineered avoiding high loading on a small area the problem with other versions, don't want any fractured floors!! Have you arrived at a price for 25mm ones? That said what is your suggested height, I know it's a personal one. Surprised no-one else has expressed interest. bentley-boy wrote: That looks nicely engineered avoiding high loading on a small area the problem with other versions, don't want any fractured floors!! Have you arrived at a price for 25mm ones? That said what is your suggested height, I know it's a personal one. Surprised no-one else has expressed interest. It will cost you £22.50 as there is a 25% discount on the first order. The reason is that they are prototypes and are "scarred" where I may have had to make adjustments to sizes, etc., but they are fully functional. My preference is for either the 10mm, 15mm or the 20mm. I think 25mm is too "laid back", but it is perfectly functional. I suggest that you fit a range of spacers (such as pieces of wood) under the seat to find the height that suits you best. I've just made some plastic gauges that can be used to test the four heights. They were a pain to make as they took 24 hours on a 3D printer and the print was only successful on the third attempt . For you to borrow them, all I ask is that you gift me (via PayPal) the £2:60 postage and return them when finished using the label and stamp provided. There are enough gauges for one seat to range from 10mm to 25mm. The first gauge is the 10mm gauge and each of the others adds on 5mm. That is great, i will purchase a 25mm kit right now. xtLSport wrote: Congratulations pingu!! Looks great. I can't post them until Tuesday as the Post Office is closed due to public holiday. I've refunded you £7.50 as you were the first to buy and get a 25% discount . Seat is coming out to have the bolster refurb'ed next week so it will go back in with the kit. Tufarlian wrote: My kit arrived today. I just received my kit, I will install it this weekend! xtLSport wrote: I just received my kit, I will install it this weekend! I have the material to make more kits if I run out of stock, but it may take about a week to make another batch. I'm happy to sell at a 10% discount off eBay using PayPal gifting, but I understand if they want the security of eBay.